I am trying to recover data from a 1 TB(~932GB) hard drive to a 1 TB SSD. 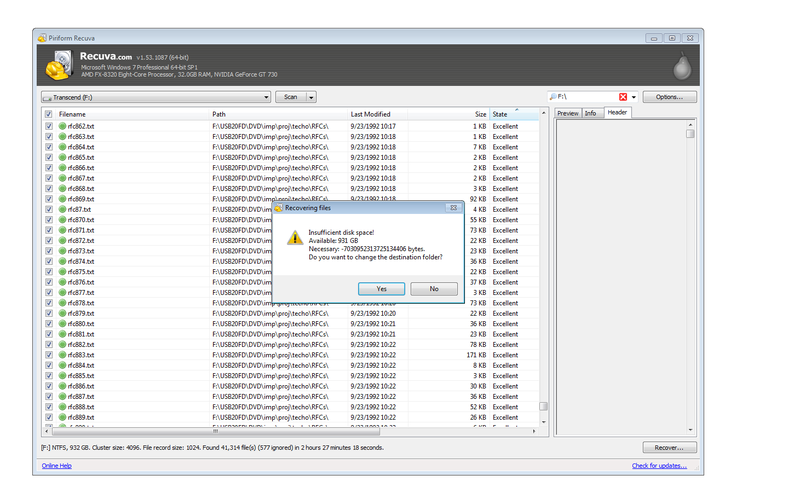 The list of files after the scan looks ok but when I try to recover it throws up a weird error message. Look at the size requirement in the dialog, it is a negative number. Is this a known issue ? How can I workaround it ? Please let me know as I am blocked due to this. I am using latest version of Recuva. 1. No easy way to select files for a particular folder or by type. Is this feature available in paid version ? 2. It says 577 files were ignored so they are not even reported after the scan. Is there any way I can at-least get the names of these files ?